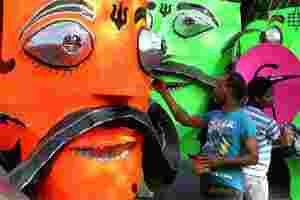 An artist giving final touches to the effigies of Ravan. PTI. When I was a correspondent based in South-East Asia, my reporting trips sometimes took me to small towns in Thailand, Malaysia, Indonesia, Vietnam, and Cambodia. Among the pleasant discoveries I made then was the familiarity the people had with the story of Ramayan, the Sanskrit epic that most Indians, Hindu or not, know well. But how different were the versions they knew from the one I did—and who was anyone to tell them or me that one version was authentic, or better, than the other? The idea of Indianness meant appreciating diversity, given the idea of vasudhaiva kutumbakam, or the world is a family. For the generation of Indians that has grown up only on Ramanand Sagar’s version of the epic, the tales of Javanese wayang kulit (shadow puppetry) would appear perplexing; they blended aspects of the other Sanskrit epic, Mahabharat, with Ramayan. If you were seeing the Malay Hikayat Seri Rama, Lakshman was the hero, the brave brother who spurred Ram to action, a bit like Krishna did to Arjun in Mahabharat, where Krishna calls upon a reluctant Arjun to join the battle against his cousins. I had never known these other Ramayans; the stories I grew up with, listening to my grandmother, came largely from Valmiki’s and Tulsidas’ Ramayans. So the prevalence of so many Ramayans was an unexpected discovery, a matter of joy, and manifestation of the power of epics and myths, as tales of good and evil, laying down a moral code without being didactic. Now those moral guardians, Hindu nationalists, enforcers of a unitary code, want us to recognise that there is only one Ramayan (whose? Tulsi’s? Kamban’s? Valmiki’s?). And referring to other versions is “blasphemous", and too dangerous for young undergrads at the Delhi University to read. The essay that has bothered them the most is Three Hundred Ramayanas: Five examples and Three thoughts on Translation, which the late A.K. Ramanujan wrote, and is a part of Paula Richman’s excellent book, Many Ramayanas: The Diversity of Narrative Traditions in South Asia. It unveils the epic’s many interpretations, and points to its richness and relevance. The withdrawal of the essay from the undergraduate syllabus by the university is wrong at so many levels. First, the essay celebrates the epic (and so what if it didn’t); two, it is of great academic value; three, it is not blasphemous; four, Hindu culture doesn’t have the concept of blasphemy; and five, the whole point of education is to expose one’s mind to alternative views and not close off the windows to alternative thoughts. More frustrating, exasperating and troubling is the attitude of the Oxford University Press (OUP), which acquired the rights to the book for India from the University of California Press, which originally published Richman’s book. Responding to a complaint, the Indian affiliate of one of the premier academic publishers in the world promptly apologized, and said it would no longer distribute the book. In this instance, this particular publisher is at least being consistent: a few years ago, after the Sambhaji Brigade ransacked the Bhandarkar Oriental Research Institute in Pune because the institute’s staff helped the American academic James Laine with research while he was writing a book on Shivaji, the Maratha warrior-king, OUP took that book off the shelves, even after courts ruled in the book’s favour. Shakespeare comes to mind: “Cowards die many times before their deaths, the valiant never taste of death but once." In a scathing critique of OUP in The Telegraph, Rukun Advani (who formerly worked there and now runs another imprint, Permanent Black) asks if OUP had never heard of the spirited defence Penguin mounted against the censorship of D.H. Lawrence. Or Sylvia Beach. In Paris, near the Luxembourg gardens runs a lane, Rue de l’Odeon. There is a small plaque on the wall of the building numbered 12, which says in French: “In 1922, in this house, Miss Sylvia Beach published James Joyce’s Ulysses." It is an important landmark in the history of free speech: major English-speaking nations had banned Ulysses because it was considered “obscene". Beach thought otherwise; she decided to publish the book and shipped it to readers, thinking of creative ways of beating the censors. As the grandees of the Delhi University and OUP cower and withdraw the Ramanujan essay and even the book, in the spirit of Beach, and in honour of Ramanujan, here’s a site from where you can download the essay http://www.sacw.net/article2344.html. Read it, argue over it, question it, challenge it and marvel at India’s diversity, which Ramanujan celebrates.